Russian coaches say charges against Varlamov a "misunderstanding"
The arrest of Denver Avalanche goalie Semyon Varlamov on charges that he kidnapped and assaulted his girlfriend has shocked Russian hockey coaches and experts back home, who were hoping the goalie will still play on the national team in the upcoming Sochi Olympic games. 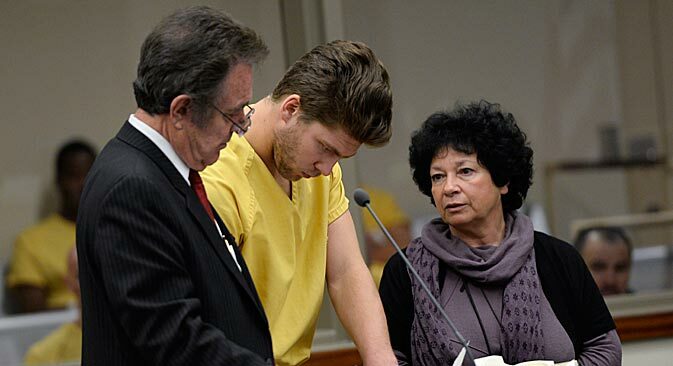 A Denver court on Oct. 30 charged Varlamov, 25, with second-degree kidnapping and third-degree assault stemming from accusations from his girlfriend, Evgenia Vavrenyuk, who claimed he kicked and beat her in a drunken rage. The judge released Varlamov on $5,000 bail on Oct. 31, allowing him to continue to play for the Avalanche but prohibiting him from contacting Vavrenyuk. Varlamov’s agent and attorney have said he is innocent. A trial is set for Nov. 14. Russian hockey specialists and acquaintances of Varlamov reacted with disbelieve, saying they doubted he was capable of the violent acts he is accused. Alexei Kasatonov, the general manager of St. Petersburg SKA and Russia’s national team, said in an interview with Izvestia that the management of the national team is prepared to lend full support to the goalkeeper. Kasatonov said the headquarters of Russia’s national team still views Varlamov as a candidate for the Olympic team and have been discussing the goalkeeper’s play with the national team’s head coach, Zinatula Bilyaletdinov. “No one intends to rule him out,” Kasatonov said. Alexander Varlamov, the player’s father, in an interview with R-Sport news agency said his son committed no crime, and that the truth will surface during the court hearings. Vladimir Plyuschev, the former head coach of Russia’s national hockey team, told the news website Gazeta.ru that overly dramatizing the situation surrounding Varlamov could have adverse effects on his performance as the country prepares to host the 2014 Winter Olympics. “Of course, the psychological remnants after all these events could negatively affect Varlamov, especially on the eve of the Sochi games. Still, I don’t think there was a criminal action there,” Plyuschev said. Yuri Yakovlev, president of Yaroslavl’s club Lokomotiv and Varlamov’s mentor, said the charges against the goalie sounded like a misunderstanding. “This doesn’t seem like him at all and cannot be true,” Yakovlev told ITAR-TASS in an interview. Alexei Dementiev, a hockey agent who has worked for 18 years as an NHL scout, described Varlamov as a “well-educated and cultured person.” He also expressed his concern about the timing of the arrest. “The worst is that this incident happened during the Olympic season, when Varlamov had an excellent start to the season for Colorado,” Dementiev said. Based on materials from Izvestia, Gazeta.ru, RIA Novosti and ITAR-TASS.